I posted earlier this week on Do Nows-a primer on one of the fundamentals of an effective classroom. Today during a meeting, Joaquin Hernandez, one of the ace Uncommon Schools Teach Like a Champion Team members, shared the attached image with me. It’s a picture of the Do Now that Taryn Pritchard of Leadership Prep Bed Stuy used with her class a few weeks ago, with Taryn’s notes to herself on it. If you look closely you’ll notice that there are actually two layers of notation: those in darker ink that Taryn made to herself before she started class. 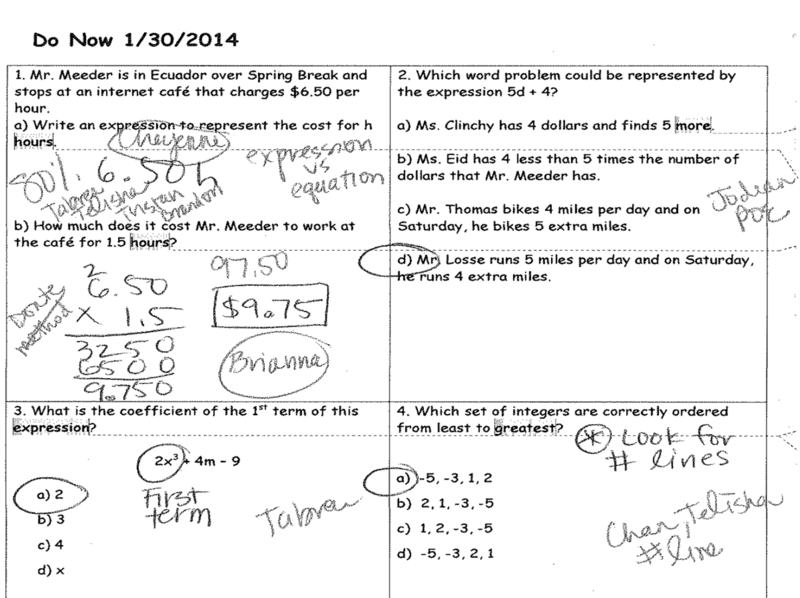 They include the answers to the problems, the “shown” work for problem 1, and a note to herself to look for “number lines” on problem 4. This is a great example of “Tracking not Looking” from the Check for Understanding technique…. you gather data best when you know what you’re looking for and focus on most important things. In slightly lighter ink you can see the notes Taryn took as she circulated during her Do Now. She noted that 80% of students got number 1 right but also the four students who didn’t. She noted a student whom she wanted to call on for each problem—i.e. “Brianna” for 1.b, “Jordan” for 32 as well as a key issue that emerged unexpectedly—the difference between expression and equation. Taryn has not only demonstrated fantastic Check For Understanding skills, she’s prepared herself to review her Do Now efficiently and with maximum value in five minutes or less by doing most important things first. What a great model of methodical observation for any teacher to follow.